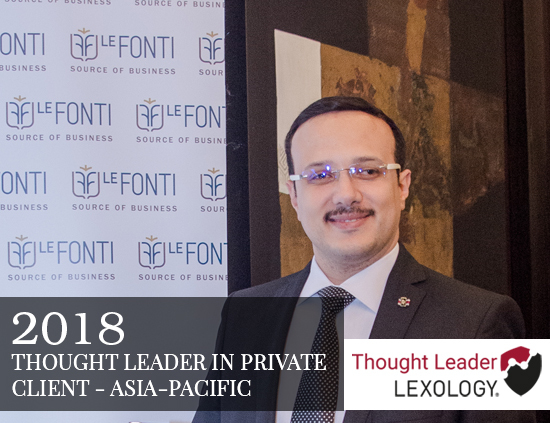 Hassan Elhais has been recognised as a Thought Leader in Private Client – Asia Pacific for United Arab Emirates in the first Lexology Awards. Mr Hassan Elhais has drafted and supervised the drafting many cases across all areas of law over the past decade. (1888PressRelease) October 23, 2018 - Relying on a bespoke automated process to analyse Lexology data, the Lexology Awards reward law firms which produce great legal content for their subscribers. At the end of each quarter, individual authors are recognised as Legal Influencers, and law firms or contributors as Thought Leaders. Hassan Elhais has beaten off stiff competition to be recognised for their work. With over 14 years' extensive experience practising as a legal consultant, Mr. Hassan Mohsen Elhais has a wealth of knowledge and experience within the legal sector. Mr. Elhais is committed to delivering the best possible legal solutions through his varied expertise which includes, amongst other things, arbitration, banking law, commercial law, company law, criminal law, family law, extraditions, inheritance law, the incorporation of companies, labour law and maritime law. With significant experience in the UAE local market, Mr. Elhais specialises in drafting statements of claim, memos, replies and legal opinions for both corporate and individual clients He is also a seasoned litigator and arbitration counsel. Lexology delivers the most comprehensive source of international legal updates, analysis and insights. We publish in excess of 450 articles every day from over 800 leading law firms and service providers worldwide across 50 work areas in 25 languages. Our searchable archive now contains more than 730,000 articles. Our combination of timely, quality, granular information and relevant insight supported by our intuitive, innovative technology provides an unparalleled user experience. Globe Business Media Group are a leading provider of business intelligence for the legal and intellectual property markets. Through our market-leading insight, we inform and connect a highly engaged community of over 350,000 legal and intellectual property professionals worldwide. With more than 150 dedicated staff over three continents, we produce high-quality subscription products, intuitive platforms and engaging events for our international client base.